Grrrr .... I'm late with this post. :S I just noticed Blogger never pubished the post I had scheduled for yesterday. As you know, Thursdays are the days when the new challenge goes live at Crafty ribbons, but since I was away the whole day yesterday (I only got home in the evening), I scheduled the challenge post. Yesterday I forgot to check if it went live, but today I noticed it didn't. :S I'm very sorry about this. Oh, and we have a great prize for you too. You know I love dotty thingies, don't you? I hope you do as well. 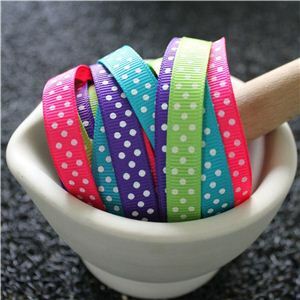 Because the lucky winner of this challenge will win these gorgeous dotty ribbons from Crafty ribbons. Blogger is playing up for me too and publishing posta a week early. I think they need to sort it.